There are a host of factors to consider when buying a piano, either new or secondhand and the multitude of choices out there can make the whole task rather daunting. The cost of buying a piano is a relative large sum, so we want to ensure you get the best possible advice by providing a guide to buying a piano. Whatever you decide upon it is always advisable you have have played it ( or heard it if you do not play) as no two pianos are the same, even if they are the same make and model. With new upright pianos prices starting around £2500 and going up to £20,000 and more, it’s a good idea to decide on a budget that is going to get you an instrument suitable for your needs. Generally the amount that you pay for a piano determines the quality of the piano -we recommend that you spend as much as you can afford. 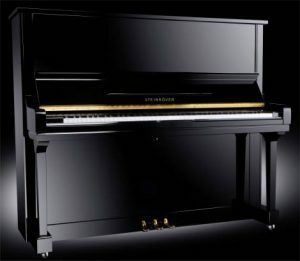 Many factors affect the price; whether it is a grand or upright piano, its size, the style of the case, the quality of the manufacture of the soundboard, the action, the frame design, and the finish. The first decision is whether you want a grand or an upright piano and often the size and cost are determining factors in this choice. In general, a larger piano with longer strings will sound better than a smaller instrument. Grand pianos come in a wide variety of sizes and styles and your choice of a particular instrument can often be down to individual taste. Upright pianos come in two basic case styles – compact ‘modern’ and traditional. The traditional has a square-fronted cabinet with columns and toes which gives good stability because of its wider base. The compact version has a plain sloping fronted cabinet with the keyboard jutting out from the centre. The usual finishes are Satin and High Gloss which are durable when looked after carefully. These finishes should simply be wiped with a clean damp cloth — never use a spray polish on this type of surface. Some wood finishes are very expensive and are only available as a special order. Real wood veneer finishes are expensive because choosing the wood, matching it and applying it to the case takes time and skill. In addition to the usual Piano Black, common colours are Walnut, Mahogany, Cherry and Beech. Pianos with actions made using better quality parts and hammer felts cost more but these improve the sound of the instrument and how it feels to play. A good frame design can also have a beneficial effect. Buying a well-known make of piano from a reputable dealer like Suffolk Pianos should be problem free. There should, for example, be a five year guarantee with a new piano. There are a range of new pianos on the market, and in the lower price range they are likely to have been manufactured in China (also now the world’s largest consumer and manufacturer of pianos) or Korea and Indonesia. Is this a bad thing? No it is not as a) the Chinese piano manufacturing industry has improved in leaps and bounds in recent years and b) many of the important internal parts of the pianos they are putting together come from Europe. Sadly, most older pianos are, at best, of mediocre quality even if they have great sentimental value – they are just worthless pieces of furniture. This is because a century ago every home aspired to have a piano – it is what we had in our living rooms rather than a TV. As a result of demand, there were over 300 British piano manufacturers in the 1920s , with not all of them building their instruments to a good standard. There is now a huge glut of these old pianos, even though demand has gone. However, if you can buy a sought-after piano which has a good name and quality build, and which has been refurbished to a high standard, you are buying a recession-proof investment. At worst they should hold their value, but at the top end you can expect them to rise in price. Helpful hint no 1.- Age Matters! You need to find out the age of a piano. Apart from a few rare exceptions, a piano is pretty much like a car – unless it has been refurbished, the older it is the worse it is. 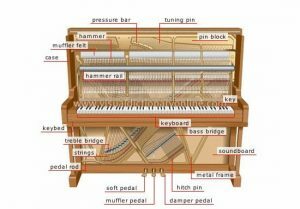 There are many serious problems which can arise with used pianos, especially the much older ones. Older pianos can have serious structural problems usually caused by central heating or just the age of the materials. Many have loose tuning pins or even cracked pinblocks, so they will not hold in tune. The bridge or soundboard can be split or worse still the iron frame may be cracked. Strings can sound dull or be rusty and on the verge of breaking. These sorts of problems are very expensive to repair. 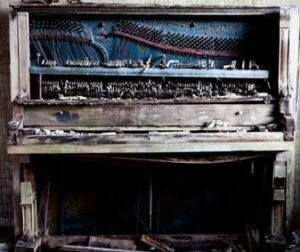 As well as structural faults, older pianos usually need a whole range of attention to the playing mechanism due to severe wear over the years, such as worn hammers or weak dampers. A lot of work is involved here which can be costly. The condition of the cabinet may be problematic and may reflect on how the piano was looked after. This is all without considering the condition of the cabinet and the cost of making the piano presentable. Newer pianos do have the huge benefit of more modern materials designed to cope with central heating as well as using better glues and more advanced methods of wood drying in their construction. In particular, they have laminated tuning blocks which provide much better tuning stability. The mechanism will not be worn out and you will have an instrument that you can rely on for many more years. Whether buying a secondhand or new piano, there are so many different piano makers that for a beginner it is a mine field. Whilst the more recent used piano can be a better prospect, giving the option of a higher quality instrument at a reasonable price, it is still important to find the right piano and even recent ones can have significant problems according to their age. There are some really good secondhand British, German and Japanese pianos around as well as some reasonably priced good new imported pianos- you just have to know which manufacturers make the grade and which don’t. or if you find the whole field overwhelming, create a relationship with your piano tuner or local shop trust their knowledge of the field. It is essential, then, that even a recent used piano is assessed carefully first, followed by the full range of checks and adjustments and then any necessary repairs carried out. When buying a piano, don’t go ahead without advice or the guarantee of a qualified technician. At Suffolk Pianos, we start by only buying good quality older pianos – with names like Broadwood, Welmar and Knight. Then we undertake often a huge amount of work to bring them up to a playing standard. Even we make mistakes though and end up having to scrap a piano because it requires too much work to make it a viable case for refurbishment. When we have finished all the work we always guarantee our pianos. This brings a great deal of peace of mind for our customers. Please ring us for more information including what kind of checks and work we undertake to bring our pianos up to a good standard. When buying a piano, it is important that you don’t part with your cash before being 100% happy. Our helpful guide should give you the tips you need – or get in touch if you’d like to know more.